Region: The Corn Borer is found in northern and central United States and southern Canada. It has not yet spread to the west or Florida. Life cycle: The larvae hibernates in stalks and pupates in spring. The nocturnal moth appears in May, or early June in Canada. This borer produces one to three generations each year. Physical Description: The larvae are flesh colored (grayish pink) Caterpillars, up to 1 inch long, with a dark head and rows of small, dark brown spots on the top of each segment. The adult is a yellowish brown moth with dark bands on its wings. The males are slightly darker than the females. The eggs are white and are laid in masses of 15 to 20, on the underside of leaves, overlapping each other like fish scales. Feeding characteristics: The young larvae chews on leaves and can be found inside corn kernels, and may feed on other plants. Broken silky tassels and stalks, and sawdust outside of small holes are indications that Borers are eating your corn. You may find this insect on other plants besides corn. It is known to attack more than 200 different plants. 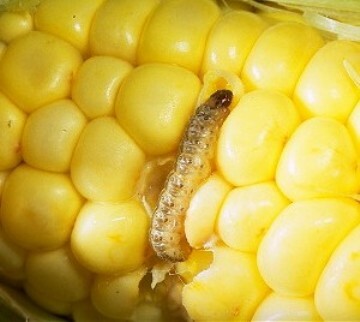 The borer is a serious pest of market sweet corn and canning corn from Quebec eastward. The European Corn Borer is no longer a major problem of grain corn in southwestern Ontario, due to recent resistant varieties. Controls: handpicking is the simplest and most effective way to remedy affected corn. For plants showing visible signs, split the stalks below the entrance holes and remove the Borers. You can attract swallows with birdhouses and ponds. Woodpeckers and flickers may also hunt among the crop for this pest. Parasites such as the Braconid Wasp (Macrocentrus grandi) and the Tachinid Flies (Lydella stabulans grisescens) have been used with considerable success. You can also attract them by a daylight-blue lamp, and draw them to their death. Lady Beetles are also a gardener's friend, eating up to 60 borer eggs a day. Other commercial egg parasites, such as the Trichogramma Wasp, are also available. Shred and plow under the cornstalks in or near fields where Borers overwinter. Do this in fall or early spring, before the adults emerge. Plant as late as possible, but stay within the normal growing period for your area. Natural insecticides ryania and sabadilla are quite effective against this pest. Although there are no strains immune to this pest, there are plant hybrids that are resistant or tolerant. Consult your county agent for local recommendations.